Interact Marketing develops an innovative digital dashboard to track the agency’s efficiency, budget and profitability. The touchscreen digital dashboard is in line with the company’s 2019 First Quarter theme of “See Clearly Now”. 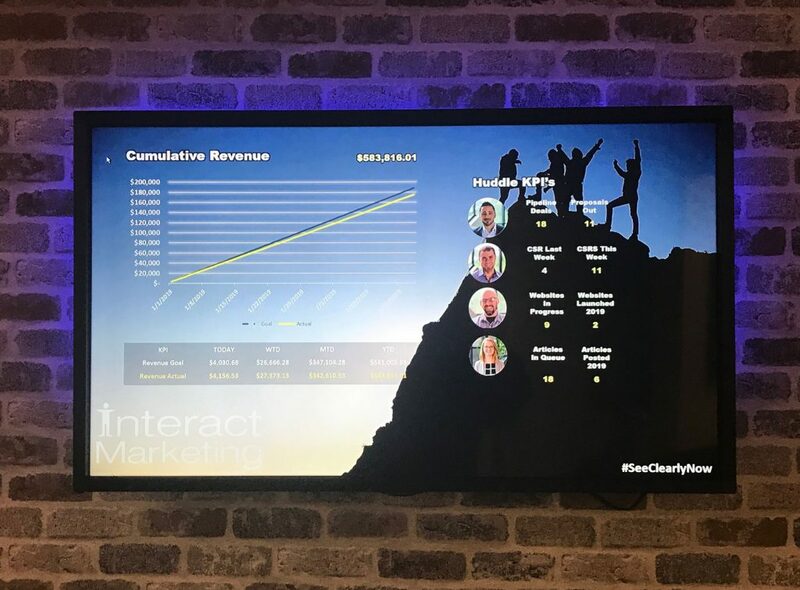 NEW WINDSOR, N.Y. (PRWEB) MARCH 14, 2019 – Leading New York digital marketing agency, Interact Marketing, developed a digital dashboard to have a centralized place in the office to track KPIs, quarterly priorities and critical numbers to connect daily efforts to long-term goals and vision. All employees have the ability to see the digital dashboard as a daily reminder on their specific quarterly KPI. The digital dashboard exhibits the team’s goals and provides a finish line for them to celebrate goals met. Inspired by the “Rockefeller Habits” series by Verne Harnish, the digital dashboard embodies a theme, measurable goals, priorities and much more to lead the team to success. Rockefeller Habit number ten states that the company’s plans and performance must be visible to everyone as a way to ensure all stakeholders are aware of expectations in work output. In order to accomplish this, Harnish recommends a scoreboard, or digital dashboard, be in plain sight at a central meeting area. The digital dashboard will showcase valuable KPIs to all employees and even clients during in-office meetings. It is designed to optimize customer service and staff efficiency. Staying on time and on budget for client projects, understanding resource allocation, and setting trackable goals for revenue and profitability are all valuable KPIs that employees can take away from giving the digital dashboard a quick glance throughout the day. Since founding the company that would eventually become Interact Marketing in 2007, Joe Beccalori and his team have served over 250 clients in search engine optimization, web development & design, social media marketing and online reputation management. The digital dashboard has been a goal of Beccalori’s for some time now and has finally come to life in 2019. Along with setting goals and tracking KPIs, the dashboard is designed to benefit clients when they visit Interact’s headquarters. They will quickly be able to see how their campaign is performing, where their resources are being used, and the vision the Interact team has for the future of the campaigns.